Combine the chilli, garlic, lemon rind, cashews nuts, sugar and 1 tablespoon oil in a small processor. Process until finely chopped. Alternatively, you can use a mortar and pestle. Heat a wok over high heat until hot. Add remaining oil and swirl to coat the wok. Add the broccolini and stir fry for 3 minutes until bright green. Add the Minicaps® Baby Capsicums and chilli mixture. 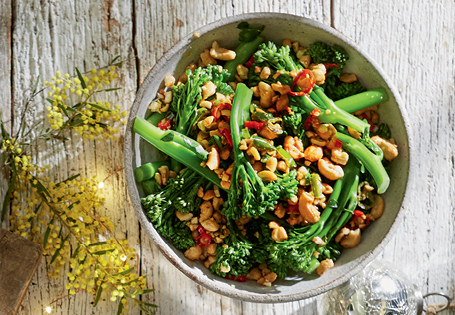 Stir fry for 2-3 minutes or until broccolini is tender. Tips: Serve as a side to chicken, beef and lamb, or enjoy as a vegetarian meal with rice or noodles.